GravenhurstFrom the German Graven, to cut and Hurst, wood Scott-1969, p. 12 . [Gravenhurst] is a register station for Huntsville subdivision trains except extra trains originating or terminating at Muskoka Jct. Track for meeting of passenger trains is second track in front of station. The track known as "Service Track" is first siding immediately North of Gravenhurst station and West of main track. Capacity 32 cars. Trains moving Northward must not leave this service track at speed exceeding five (5) miles per hour and main track switch must be set for any such movement before engine or car passes "Foul" post located at the end of the bonded area on this track. 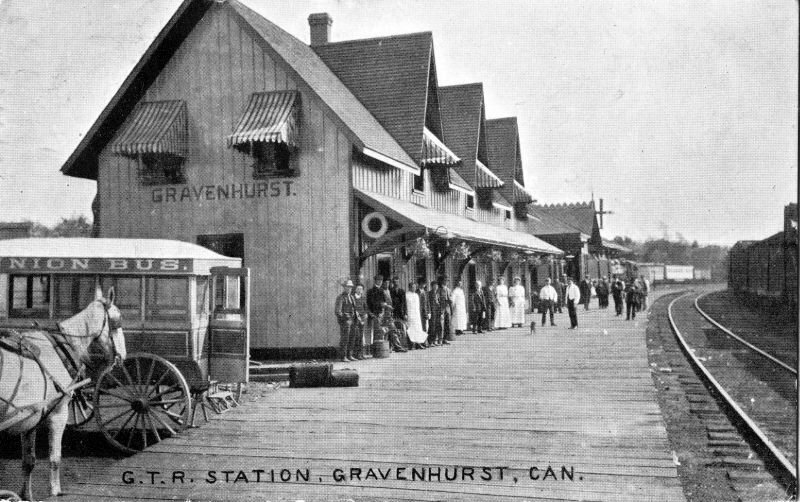 Gravenhurst is not a register station for trains originating or terminating at Muskoka Jct. Trains must obtain terminal clearance at Gravenhurst. The track known as "Service Track" is first track immediately North of Gravenhurst station and West of main track. Capacity 32 cars. Cara Holdings Limited collection / NAC / PA-195222 G.T.Ry. station refreshment room. JPS collection Postcard view of first station in the GTR era. Printed by Warwick Brothers & Rutters Ltd., Toronto. Postmarked February 6, 1911. Osmond Fenwick Adams / NAC / PA-030617 Second station in the G.T.Ry. era. Osmond Fenwick Adams / NAC / PA-030618 Second station in the G.T.Ry. era. JPS collection Second station in the G.T.Ry. era. n.d. NAC / Col. RG30M Acc. 78903/42 Item 294 Proposed alterations to double dwelling. Ground and first floor plans. Fireplace plan and section. n.d. NAC / Col. RG30M Acc. 78903/42 Item 295 Proposed alterations to double dwelling. Basement plan. Front and side elevations. n.d. NAC / Col. RG30M Acc. 81293/55 Item 276 Track plan. Mill sidings. n.d. NAC / Col. RG30M Acc. 81293/55 Item 277 Track plan. Switch to Tart's Mill, profile. n.d. NAC / Col. RG30M Acc. 945103 Box 7 G.T.Ry. Refreshment room. n.d. NAC / Col. RG30M Acc. 945103 Box 8 Proposed yard office. 1875c NAC / Col. RG30M Acc. 78903/42 Item 1118 NRC Map. 1875-05-27 NAC / Col. RG30M Acc. 934002 Item 77 NER Survey 1in.=400ft. 1875-07 NAC / Col. RG30M Acc. 78903/42 Item 296 NRC Passenger and freight house. Plan. Elevations. Sections. 1877-09-16 NAC / Col. RG30M Acc. 78903/42 Item 1120 NRC Extension of station grounds. Plan. 1878-07-10 NAC / Col. RG30M Acc. 78903/42 Item 1122 Gravenhurst village. Map. 1878c NAC / Col. RG30M Acc. 78903/42 Item 1123 NRC Gravenhurst village. Map. 1884 NAC / Col. RG30M Acc. 81293/55 Item 218 N&NWR Track plan. Yard alteration for N&PJR. 1893 NAC / Col. RG30M Acc. 81293/55 Item 194 G.T.Ry. Station grounds. Plan. 1893-12-02 NAC / Col. RG30M Acc. 934002 Item 75 G.T.Ry. 1in.=100ft. 1894 NAC / Col. RG30M Acc. 81293/55 Item 195 G.T.Ry. Mickle, Dyment & Son lands. Plan. 1895 NAC / Col. RG30M Acc. 78903/42 Item 298 G.T.Ry. Alterations and additions to refreshment room. Ground and first floor plans. Front and end elevations. 1898c NAC / Col. RG30M Acc. 78903/42 Item 1124 G.T.Ry. 12th District. Map. 1906-01-21 NAC / Col. RG30M Acc. 934002 Item 78 G.T.Ry. Partial tracing. 1in.=50ft. 1919-05 NAC / Col. RG30M Acc. 78903/42 Item 299 G.T.Ry. Proposed station. Plan. Elevations. 1919c NAC / Col. RG30M Acc. 78903/42 Item 300 G.T.Ry. Passenger station. Front elevations. 1919c NAC / Col. RG30M Acc. 78903/42 Item 301 G.T.Ry. Passenger station. Rear elevations. 1919c NAC / Col. RG30M Acc. 78903/42 Item 302 G.T.Ry. Passenger station. Section. Waiting room rear wall.